Vancouver, B.C… Corvus Gold Inc. (“Corvus” or the “Company”) - (TSX: KOR, OTCQX: CORVF) announces the start of its planned aggressive 2014 exploration drill program at its 100% controlled North Bullfrog Project in Nevada. The program is scheduled to include an initial phase of diamond drilling totalling 4,000 metres to commence in early February. The primary objective of phase one is to try and expand the Yellowjacket deposit along strike and at depth. A second phase of drilling, consisting of 15,000 metres, is scheduled to start in late May. The second phase program is designed to focus on adding high-grade resources and includes initial testing of the largest and highest priority new high-grade targets in the District such as the Jolly Jane/Road Fault area. Recent exploration results from this area, which has a large high level surface alteration system similar to the upper levels of the Yellowjacket, have indicated that it could potentially host a high-grade system much like the Bullfrog deposit. 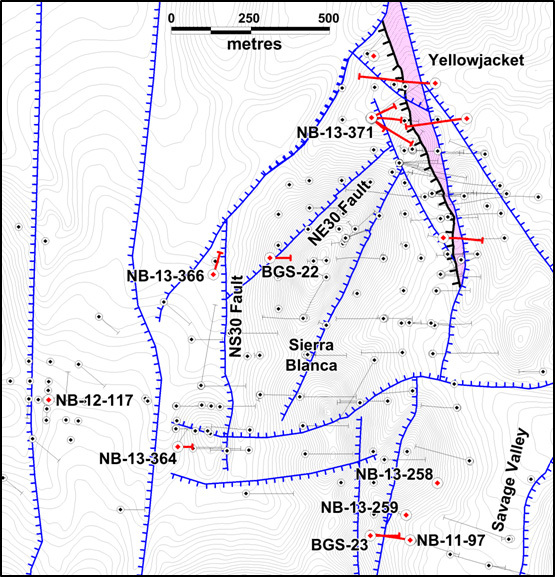 The Yellowjacket vein system has now been drilled over a strike length of 800 metres and 140 metres below the surface but remains open in all directions, particularly to the North as shown by hole NB-13-369 (37m @ 3.2 g/t gold) and NB-13-372 (28m @ 2.9 g/t gold) and also at depth, as shown by hole NB-13-370 (42m @ 4.9 g/t gold) which was drilled to a vertical depth of 170 metres.Â Geologic indications in hole NB-13-223 show that the main high-grade structural zone continues to the North for at least 200 metres farther and remains open (Figure 1). Â Following the vein north will be the highest priority in 2014. Â To date, only two holes have tested the system to depths of greater than 120 metres below the surface and, as in hole NB-13-370, the grade and width of the system appears to improve at depth as it did in the historic Bullfrog Deposit which was mined by Barrick Gold Corporation and located 10 kilometres to the south.Â This expansion potential for the Yellowjacket system will also be a primary target in the first phase. In 2013, a number of quartz veins with high gold and silver grades were found in the corridor between the Yellowjacket and the eastern Liberator Zone (Figure 1). These included holes NB-13-344 (8.3m @ 10.7 g/t gold and 9.7 g/t silver), NB-13-350 (1.9m @ 2.4 g/t gold and 6.6 g/t silver) and NB-13-352 (2.4m @ 7.6 g/t gold and 6.9 g/t silver). The structure in this corridor is complex and contains significant potential for both stockwork and other high-grade veins. Additional core holes will be drilled to follow up the 2013 high-grade vein intersections. Drilling in 2013 has proven that several structures in the vicinity of Sierra Blanca are mineralized. These include the NE30 fault, where mineralization has been intersected in holes BGS-22 (9.6m @ 0.65 g/t gold) and NB-13-371 (10.6m @ 0.7 g/t gold) along a strike length of over 550 metres (Figure 2). Mineralization has also been found along the NS30 fault, where hole NB-13-366 encountered 47.4m @ 0.93 g/t gold (Figure 2). The gold and tellurium mineralization encountered in hole NB-13-364 (22.9m @ 1.0 g/t gold) and its relationship to the gold-tellurium mineralization found in hole NB-12-117 (15.3m @ 2.4 g/t gold) has yet to be followed up as it is a strong indicator of high-grade mineralization (Figure 2). Finally, holes NB-13-258 (10.7m @ 0.7 g/t gold) and NB-13-259 (38.1m @ 0.5 g/t), which were drilled at the end of the 2013 drilling program, together with hole BGS-23 (20m @ 0.6 g/t gold) and NB-11-97 (21.3m @ 0.4 g/t gold) all indicate that multiple structures along the western edge of the Savage Valley Deposit are mineralized and represent a priority high-grade structural target for the second phase drilling program (Figure 2). Figure 1: The Yellowjacket Zone, highlighting the zone of fault interaction between the Liberator Fault and the Vein Fault where mineralization is focussed. Red collars and drill traces are mentioned in the text. Figure 2: The Sierra Blanca Area highlighting drill holes with anomalous high-grade mineralization which represent follow-up targets for 2014. Red collars and traces indicate holes mentioned in the text. BGS holes were drilled by a former operator of the property, but results are considered reliable. 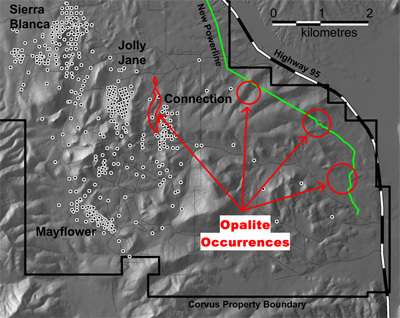 This target is defined by a strong surface rock alteration feature called opalite that develops above deposits like Yellowjacket and the historic Bullfrog mine.Â This opalite material has formed along a major north south structural trend near the Connection deposit and east of the Jolly Jane deposit (Figure 3). Â This opalite is similar and known to be the same age as the material that is found at Â Barrick’s Bullfrog Vein which yielded 2.5Moz of gold (source: USGS & Barrick Gold Corporation reports) before the mine closed in 2000. In 2013, during the construction of a power line east of the Connection target, a number of road cuts exposed opalite (Figure 3). The elevation of this opalite is similar to that at the Road Fault and in the Connection area suggesting this is a very large alteration system that could have a focus point along the Road Fault Jolly Jane structural zone and be the main high-grade feeder to mineralization in the area much like Yellowjacket is for the Sierra Blanca area. During Phase 1 of the 2014 program the opalites in this area will be mapped and analyzed to determine the highest temperature areas to then target for drilling in the second phase of exploration later in the year. Figure 3: Distribution of opalite alteration occurrences in the North Bullfrog Project area. This alteration forms above boiling zones where epithermal gold veins may have formed. This press release contains forward-looking statements and forward-looking information (collectively, “forward-looking statements”) within the meaning of applicable Canadian and US securities legislation. All statements, other than statements of historical fact, included herein including, without limitation, statements regarding the anticipated content, commencement and cost of exploration programs, anticipated exploration program results, the discovery and delineation of mineral deposits/resources/reserves, the potential to expand the Yellowjacket deposit at depth, the potential for the Company to be entering new area of the system which may hold potential for higher grades and significant expansion of the North Bullfrog District scale discovery, the potential for the corridor between the Yellowjacket and the eastern Liberator Zone to host stockwork and/or other high-grade veins, the potential for the Jolly Jane/Road Fault Targets east of Jolly Jane to host additional mineralization, whether higher grade or at all, the potential for the multiple structures along the western edge of the Savage Valley Deposit to be mineralized and to host additional high grade mineralization, the potential to expand the existing estimated resources at the North Bullfrog project, the potential for any mining or production at North Bullfrog, the potential for the identification of multiple deposits at North Bullfrog, the potential for the existence or location of additional high-grade veins, the potential for the Company to secure or receive any royalties in the future, business and financing plans and business trends, are forward-looking statements. Although the Company believes that such statements are reasonable, it can give no assurance that such expectations will prove to be correct. Forward-looking statements are typically identified by words such as: believe, expect, anticipate, intend, estimate, postulate and similar expressions, or are those, which, by their nature, refer to future events. The Company cautions investors that any forward-looking statements by the Company are not guarantees of future results or performance, and that actual results may differ materially from those in forward looking statements as a result of various factors, including, but not limited to, variations in the nature, quality and quantity of any mineral deposits that may be located, variations in the market price of any mineral products the Company may produce or plan to produce, the Company's inability to obtain any necessary permits, consents or authorizations required for its activities, the Company's inability to produce minerals from its properties successfully or profitably, to continue its projected growth, to raise the necessary capital or to be fully able to implement its business strategies, and other risks and uncertainties disclosed in the Company’s 2013 Annual Information Form and latest interim Management Discussion and Analysis filed with certain securities commissions in Canada. All of the Company’s Canadian public disclosure filings may be accessed via www.sedar.com and readers are urged to review these materials, including the technical reports filed with respect to the Company’s mineral properties.